Many people have passed the TOEIC exam, in some people have heard of but never went. I was reading a tutorial to test yourself. Need help with the tutoring TOEIC courses seriously to the goal. Take the test to be used as a passport to a job. Most of the dialogue in TOEIC exam might related with activities everyday life time appointment, but other tests may be a matter of history, science, literature, we rarely used in everyday life, much like TOEFL test will give a lecture in a classroom simulation. There are a few types with TOEIC Exam such as TOEIC Classic, TOEIC Redesign, TOEIC Speaking and Writing as depend of examinee objectives. 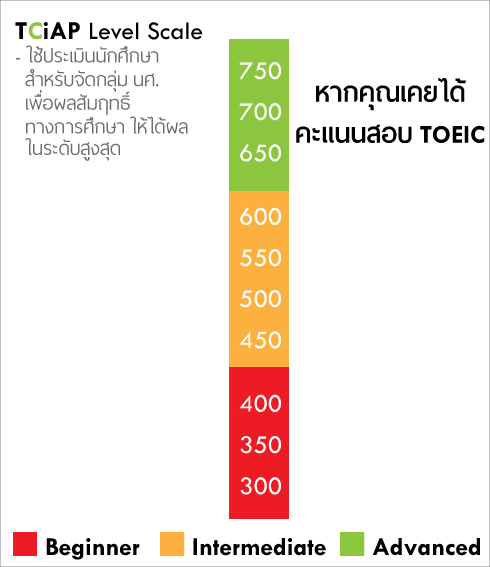 Mostly in Thailand apply for TOEIC Redesign. The Center for Professional Assessment offers regular institutional testing every Monday through Saturday at 9:00AM and 1:00PM. The TOEIC test is a two-hour multiple-choice test that consists of 200 questions divided into 100 questions each in listening comprehension and reading comprehension. Each candidate receives independent marks for written and oral comprehension on a scale from 5 to 495 points. The total score adds up to a scale from 10 to 990 points.